for the replacement of existing Three-Phase or Independent-Phase controls. 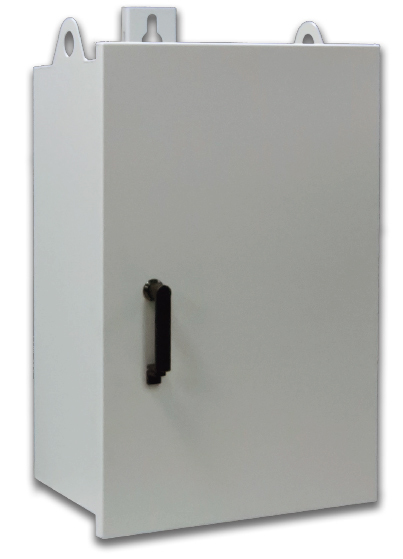 M‑2979 Recloser Control Cabinet Cabinet houses Beckwith’s M-7679 R-PAC in complete recloser control replacement applications. The M-2979 includes the capability to change out the Recloser Control and Cabinet as one component. control. The M-2979 Recloser Control Cabinet meets or exceeds NEMA 250, IEC 60529 and IEEE C37.60. recloser control application and environment, or the cabinet can be supplied completely empty. Each enclosure includes the applicable connector layout in the bottom that replicates the specific recloser control enclosure being replaced. Also provides penetrations for options and future customer added accessories. Connector mounting hardware is only accessible from inside of enclosure. The M‑2979 Recloser Control Enclosure, when combined with the M‑7679 R-PAC, provides convenient direct replacement of the control and enclosure for the following reclosers. Eliminates the need for expensive rewiring of I/O signals accepting existing connector plugs for power, control, voltages and currents with the same pin sequence. Simplified plug-support for all interface options including: 14, 19, 32, 37, and 42 pin options. 430-00621 RS-232 Radio Com Cable – 6′ length. 430-00622 RS-232 Radio Com Cable – 6′ length, Male to Female, null modem. 430-00623 Ethernet Radio Comm Cable – 6′ length.